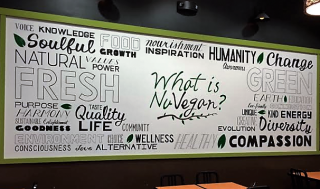 NuVegan Cafe is an all-vegan fast casual restaurant. Menu items include smoothies, sandwiches, burgers, salads, hot and cold sides, desserts, and brunch food (on Sundays). The customer service is excellent and the food is fresh and delicious. Samples are available. Meat and dairy production are incredibly unsustainable practices and animal products often do not agree with the human body. Treat yourself to tasty comfort food without the negative impacts of animal products, or opt for a healthier option. Either way, your body and the planet will thank you and you'll never feel like you're missing out.